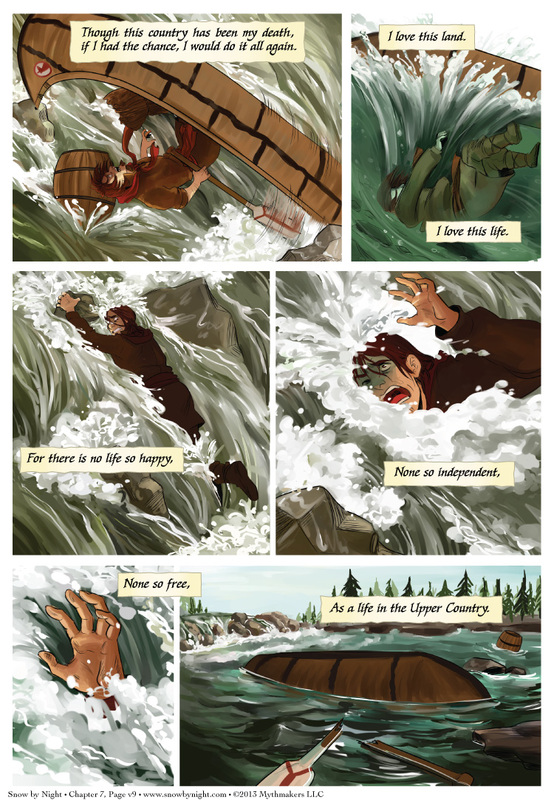 Peyre meets his end in the icy waters of the Upper Country on page 9 of A Life So Free. Shooting the rapids was a dangerous temptation for the voyageurs. You could either carry your weight in furs and then come back and get the canoe — a process that could take hours of heavy labor. Or you could avoid all of that by shooting the rapids. The Ottowa River is littered with rapids named after the voyageurs that drowned there. To see the a preview of the final page, please vote for Snow by Night on Top Web Comics. This week’s SpiderForest webcomic of the week is Kaspall by Lucy Lyall. It’s a long-running (from 2005) mystery comic. A good bit of the supernatural creeps into the story so be ready for thrills and chills. oh god, panel 4 makes me so anxious. I WAS HOLDING MY BREATH LIKE DON’T DIE BUDDY even though I know he has to, as per the story lol…fjdgkdf. lotta kudos to the artist. Meh.. there could stile be an expected “unexpected” return. “Reports of my death have been greatly exaggerated”. After all.. no body has been shown yet. Congratulation for this page! The water looks superb.